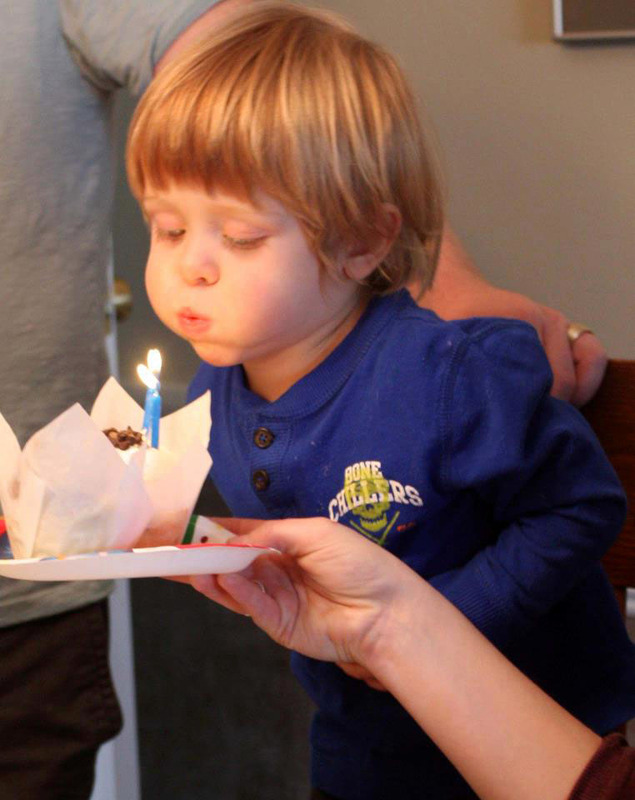 « What I learned about Washington D.C.
Rohan turned 2 on Feb. 15, 2012. He's now lord and master of 1006 Oak Park Blvd. I love my family. I really, really do. And I am not just saying that because they are the only ones who will read this post. But I am concerned. Their minds and bodies have been abducted by a 2-year-old. Lisa and I visited Iowa this past weekend. It was her spring break, God bless her. She left 70-degree Philadelphia to be in Iowa, which was experiencing unseasonably warm temperatures at a balmy 40 degrees. Not only was Lisa willing to visit Iowa, but she voluntarily spent four straight days with my family. Which isn’t a terrible thing, but by the end of the visit, we were exhausted – worn down like a 1988 Buick Skylark at the Idaho State Fair. And this was mainly because of the whirling dervish that is my 2-year-old nephew Rohan. He’s my brother’s kid, and when it comes to karma, Aaron got what was coming to him. This is a sweet kid. He really is. And intelligent. And when he grows up, Rohan will be a well-adjusted, valuable member of society. 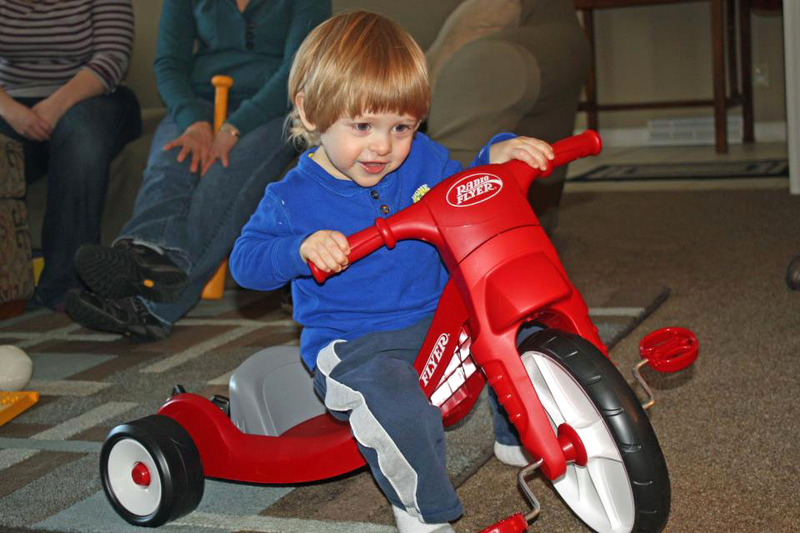 But right now he is a 2-year-old, and he reigns over my parents’ household. Like a miniature Caligula or modern-day Tutankhamun. Wherever Rohan goes, an entourage is in tow. If he wants to chase after the dog, his mother, aunt, grandmother and great-grandmother follow in his wake, trying to keep up with this mop-topped Speedy Gonzales. Rohan does speak, and he is particularly demanding. All he needs to do is utter ‘Grampa’ or ‘Yaya’ (his interpretation of Grandma Sara), and the requested grandparent is at his command. Once while playing in his sandbox, he told Grampa, “Up peez,” and then pointed toward the back door, indicating that it was time for Grampa to go. Rohan on his Big Wheel that he received for his birthday. The scene of the crime. The suspects have been narrowed down to one. muttering “blue key” over and over like Sheldon. Once the blue key is located, whoever the lucky person is who discovered it, then gets to go sit in the Honda for 30 minutes while Rohan dicks around with the steering wheel and all the knobs and gadgets. Grown adults will leave mid conversation, about adult topics like fantasy baseball, to go sit in a car with this 2-year-old while he pretends to be Al Unser Jr. Admittedly even I am not immune to this imp’s powers, which are mostly derived from his precocious smile. While going for a walk, I made the mistake of counting to 3 and lifting Rohan into the air and twirling him around, like you see people do in the movies. And what did I do, I did it again. And again and again. So much that I may need Tommy John surgery. The kid does have his sincere moments. When I was sorting through the boxes of junk left behind in my parents’ basement, Rohan offered to assist. He even helped me decide whether or not to keep a few items by breaking my Hawaiian Hula doll and my Santa Fe shot glass. Those went into the junk pile. 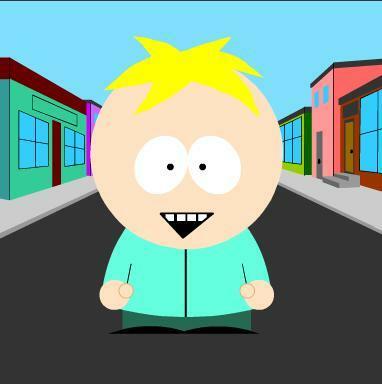 Then there was the time that he passed around soggy potato chips to everyone at the dinner table, with one of his famous South Park grins. And watched expectantly as we all put the mushy chips into our smiling maws. I don’t know has his parents do it. I think they are dead inside. By our last night in Iowa, Lisa and I were burnt out. I hate to say it, but I was a little relieved when the kid went home. We could finally play Just Dance 3 on the Playstation like mature adults. Many valuable lessons were learned this weekend. Like never take your eyes off a 2-year-old. While we were doing some work in the garage, I thought I would keep him entertained by showing him my set of silver Bocce balls. These are 8 metal balls, about 5 pounds each. But there was also a marble sized pallino I thought he would enjoy playing with. No, he wanted the heavy balls that he wasn’t supposed to play with. But figuring they were too heavy to lift, I turned my back on the kid. The next thing I knew, he had dropped one of the 5 pound balls on his head. But even that incident didn’t stop his parents from leaving Rohan in my care. Even after I let him fall out of his high chair and strapped him in his car seat improperly. Heck, they probably would have sent him home with me. For now, I am just happy to visit. They can send him to visit me when he turns 16 and is old enough to drive me home from the bar. 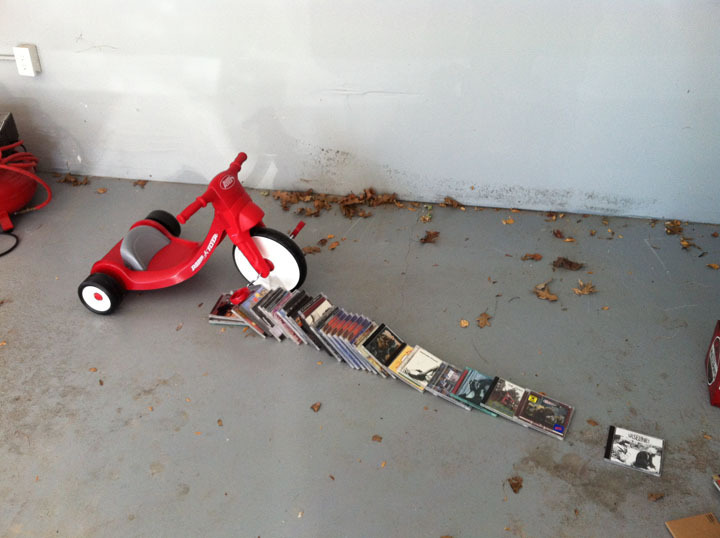 All photos by Ed Narigon, except the one with Rohan’s Big Wheel and the knocked over stack of CDs. That was taken by Chad Douglas. I loved your article Nick…you made me laugh throughout. The picture of little Rohen looks like a miniature Nick! Our grandson is turning 1 this year, so I am sure I will be just like your parents and cater to his every whim….for some reason they get you tied around their little fingers….deep down, they melt your heart! Great story…thanks for sharing! Thank you Jolene! I am glad you enjoyed the story! I get a little nervous that I am too harsh towards my family, but it is all in good fun. Rohan truly is a special little guy and it was such a joy to be able to spend time with him when he is at such a fun age. All the best to you and your family and your new home. It is so great to hear from you! Not only is he the lord and master at your parents, but unfortunately at our house, too- ugh! He is the puppet master, and I am his puppet. Seriously, it is not that bad though-lol!